I really like the Coca Cappuccino that Starbucks is featuring right now, with the combination of rich coffee, bittersweet chocolate and foamy, steamed milk. The ratios seem to be just right – especially when you don’t like your mocha drinks to be overly sweet. I don’t mind going out, but the drink is simple enough to make at home. The basic recipe is strong coffee, bittersweet chocolate syrup and steamed milk. Hershey’s syrup, or something similar will work. I used homemade cocoa syrup, which has a dark chocolate flavor and a consistency similar to Hershey’s chocolate syrup. If you don’t want to make your own syrup, Hershey’s will do just fine and still give you a very similar result. You’ll need to be able to steam your milk to get a proper cappuccino pour, but if (like most of us) you don’t have the ability to steam milk at home, you can heat milk and froth it up with a small whisk (or an electric mixer if you’re doing multiple servings) to get hot and foamy milk to finish off the drink. Don’t forget the mocha drizzle on top! In a large mug, whisk together hot coffee and cocoa syrup until well combined. Steam milk (or heat in the microwave and froth with a whisk!) and pour on top of coffee. 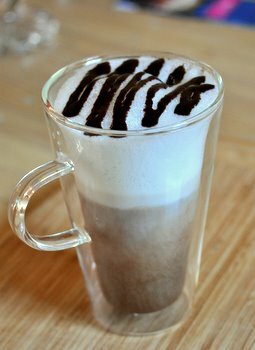 Allow foam to separate for a minute, then drizzle with extra cocoa syrup. Whisk together cocoa, sugar and salt until well blended in medium saucepan. Add enough water to make a thick paste that incorporates all dry ingredients. Add remaining water and bring to a simmer over medium heat. Simmer for two minutes. Remove from heat. Stir in vanilla if using. Let cool and store in a jar or squeeze bottle in the fridge.